Joyce Pensato: I KILLED KENNY, the artist’s first museum survey, brings together new and recent work with seminal earlier pieces. The exhibition features a monumental site-specific mural of pop-culture icon Mickey Mouse as well as charcoal drawings, key paintings, and collages made between 1990 and the present. The title, I KILLED KENNY, invokes the vernacular of South Park, framing Pensato’s visual vocabulary within the cartoon’s sardonic wit and cultural critique. Appropriating well-known American cartoon characters, Pensato’s gestural paintings and drawings combine menacing abstraction with comedic representation: Batman is depicted as a hollow, dissolving mask, Bart Simpson peers through abraded skin, and Felix the Cat is rendered as a decapitated head. Pensato’s paintings reinvigorate the legacy of abstract expressionism, imbuing her characters with an uninhibited and arresting presence. Through her dynamic application of paint and pop cultural references, Pensato’s compositions boldly extend the possibilities of action painting. 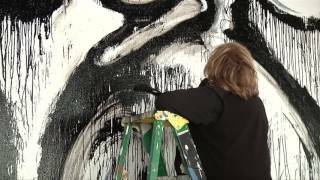 Joyce Pensato (b. 1941, Brooklyn, New York) lives and works in Brooklyn, New York. She has recently shown work at Friedrich Petzel Gallery, New York; Capitain Petzel Gallery, Berlin; Galerie Anne de Villepoix, Paris; and Corbett vs. Dempsey, Chicago. Pensato has also been included in exhibitions at the San Francisco Museum of Modern Art, and the Frac des Pays de la Loire, Carquefou. Her work is in the collections of the Museum of Modern Art, New York; the Museum of Modern Art, San Francisco; Hammer Museum, Los Angeles; the Dallas Museum of Art; the Saint Louis Art Museum; and the Speed Art Museum, Louisville. 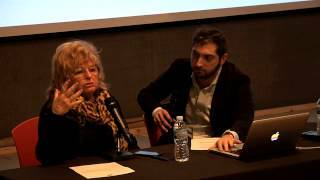 Joyce Pensato: I KILLED KENNY is organized by the Santa Monica Museum of Art and CAM Chief Curator Jeffrey Uslip. The exhibition is accompanied by a fully illustrated catalog. Major support for Joyce Pensato: I KILLED KENNY has been provided by Friedrich Petzel Gallery, the Diane and Dorothy Brooks Foundation, and the Mike Kelley Foundation for the Arts. The catalog has been made possible by Friedrich Petzel Gallery, Galerie Anne de Villepoix, and Corbett vs. Dempsey.